Ferst Luxury Studio Apartment Imagine coming home after a long day to the beautiful Atlanta skyline every night. The Ferst luxury studio apartment is created with comfort and style in mind. The layout uses granite countertops, wood accents and polished colored concrete flooring to radiate an air of simple elegance. 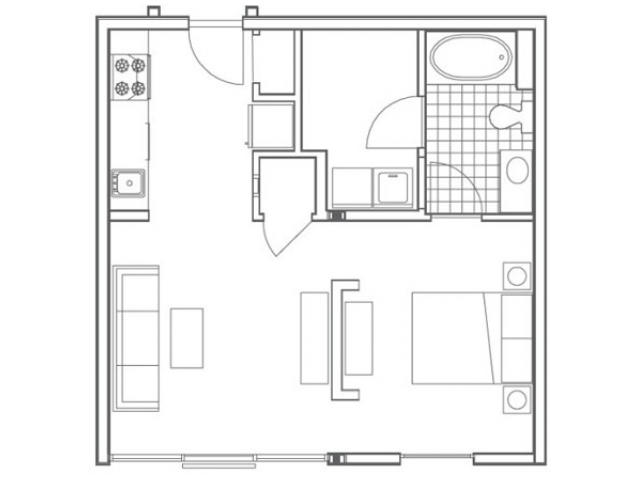 With these design elements in mind, this studio contains a kitchenette, living room, bedroom, bathroom, closet and washer and dryer hookups in 585 square feet. Amenities At 935M Apartments, all our studios and multi-room units come with a series of luxury and necessary amenities. We love our tenants and their furry friends, so our apartments and studios are pet friendly with a limit of two pets. As a tenant, you have access to 24-Hour Emergency Maintenance services, lounge areas, fitness center and resort-style pool. The Ferst floor plan provides you with these as well as skyline views from floor to ceiling windows, closet and soaking tub. Location Close to Georgia Tech, 935M Apartments is in Midtown Atlanta, GA, the home of a vibrant arts and nightlife hub. Spend an afternoon at The High Museum of Art or enjoy a stroll in Piedmont Park. With quick access to I-85 and Northside Dr., you can get anywhere in Atlanta from your apartment at 935M. Apply or Schedule a Viewing Today Your luxury studio apartment is waiting for you at 935M Apartments. We make applying, getting maintenance and paying rent easy from our all-online portal. Email , apply today or call (866) 991-5178 learn more about the Ferst space and your next luxury apartment.